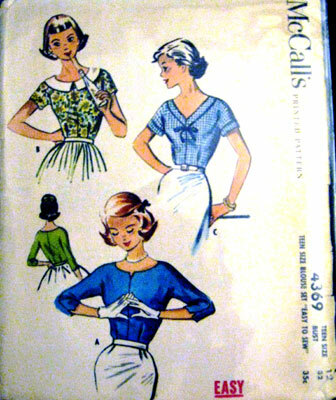 >I had just enough fabric left over from the plaid dress to make a blouse, so I dug around in the pattern stash and came up with three I’d like to make. The one I was really keen on was a lot like the top of the dress I just finished, but I didn’t have enough fabric and was determined to cut it on the bias so I could get the chevron shape. 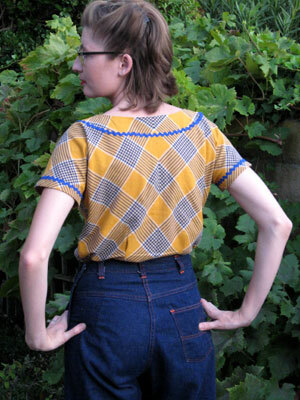 I was a little wary of making this one, McCall 4369, because it is a teen style, but it actually came out really cute and not too teen-like. I dug in the rick rack sash and picked a blue, and wore it today with my vintage jean capris I got from a friend this summer. The rick rack bow got veto’d by my husband (who said it looked too homemade) so I put a fun vintage harvest brooch I picked up at a garage sale a while back there and it was a perfect color match! My husband and I had a really fun day of thrifting and playing. 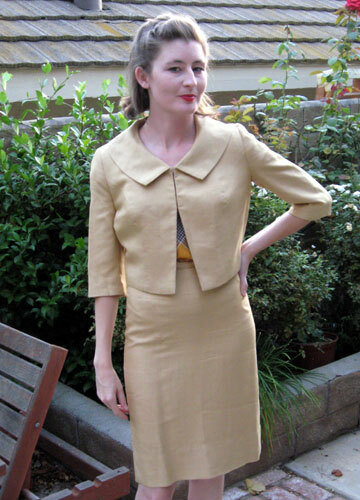 I was SO excited when I found this early 60s suit at the last minute- it’s I Magnin and is a silk shantung and reminds me so much of Audrey Hepburn, but when I got it home and tried it on for pictures I was so sad because it’s just too tight for me :( I guess it will go on etsy along with some other goodies I found today. Probably the saddest thing I left behind was a fake beaded purse- it was plastic stamped to look like beads and on the inside it was printed all over with atomic looking poodles. It was just beat to all heck, though, and so stained and gross inside. Oh well- someone will be excited when they find it. Oh, and my new favorite fast food burger other than In N Out is the Teriyaki burger at Jack in the Box. I’m usually not a fast food nut these days and stick mostly to In N Out and Rubios if I have the urge, but this one rivals a restaurant burger and it’s got teriyaki sauce and a pinapple ring on it. Yum! If you’re having a burger craving you try one out. >That blouse is really fantastic! >Are those jeans from the cigarette pants pattern you blogged about a while ago? They are adorable and I love that the waist is high but not too high. 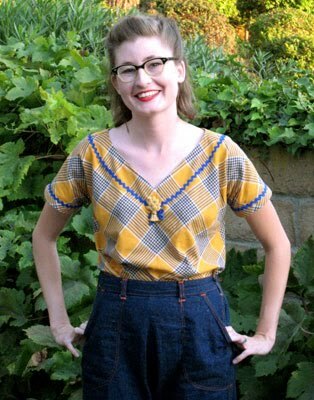 >that is so funny, I made this EXACT same shirt from that pattern, and mine ended up looking like ugly medical scrubs, I have never worn it hahaha.